Jim states that he can still fondly remember his first hands-on day at mining. Jim was only four years old at his grandfather’s manganese mine, when a miner named Jimmy Tognetti took him into his first hard rock mine. Jimmy, also known as “Jackhammer Jimmy,” picked little Jim up and tossed him onto his shoulder, stepped into a descending ore bucket, and gave the signal to lower them down into the mine shaft. Jim states today, a little over sixty years later, he can specifically remember that one day because he can still smell the carbide from the miners’ lamps. Jim’s life only grew in the mining/prospecting field. In 1954 he graduated from the McKay School of Mines with a B.S. degree in Geological Engineering. Jim completed post graduate classes in mining and spent many years as a mining consultant. Jim ended up working with several large mining corporations such as, Kennecott Copper Corporation, Eagle Picher and Kaiser Steel. Not only was Jim mining all his life, his family roots were also deep in the field of mining. His great Grandfather was one of the discoverers of the famous DeLamar Mining Camp in Nevada. His Grandfather was a partner in the mine near Ely, where Jim first saw the mine from the inside. His father, was also an underground miner in the hay days of Kimberly and Ruth, Nevada. Jim has been associated with some form of mining/prospecting for more than fifty years. He found his first gold nugget about twenty years ago on a hard rock dump pile near Tonopah, Nevada. 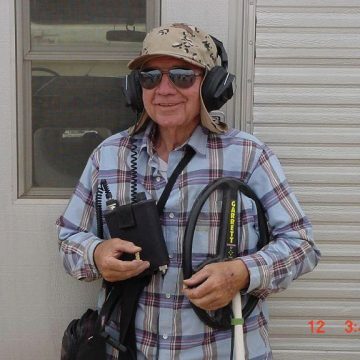 For the last 22 years he has metal detected both alluvial desert placers and hard rock gold mines throughout the Southwestern U.S.
Jim has been writing mostly freelance material for the last twenty years. Many technical prospecting/mining magazines find Jim to a major contributor. Over the years Jim has written and published many books that have contributed much success to some well known International nugget hunters. Without some of Jim’s books I would have been lost during the early stages of mining/prospecting. If you haven’t read his material, you are missing out on some premier writings. Listed below are some of Jim’s books that I carry now through “Rob’s Detector Sales:” Books always in stock, order today!